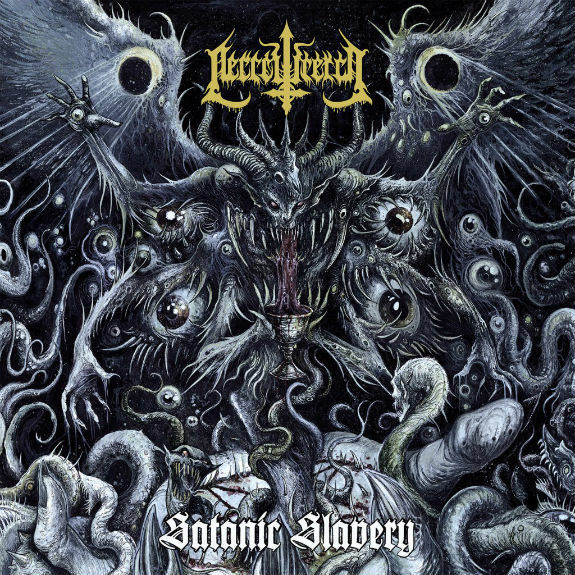 Necrowretch Posts New Song "Sprawl Of Sin"
French old school death metal outfit Necrowretch just revealed details behind forthcoming new album "Satanic Slavery." The vicious new album, the band's third full-length and first with Season of Mist, will be released worldwide on April 14th. "After almost a year of incubation in the depths of hell, we are proud to introduce you to 'Satanic Slavery' through its opening song 'Sprawl of Sin'. The song speaks about the Devil's many ways of corruption and those who carry his message to us through the Tredeciman Antiprophecies. "With 'Satanic Slavery' we are perfecting our gruesome vision of death metal: evil lyrics supported by deadly blast-beats, corrosive guitar riffs, impious bass lines, and those toxic vocals that have turned Necrowretch into the beast, which you know today. Satanas' Sprawl!" Thera Roya Streaming "Dream Of Arrakis"
0 Comments on "Necrowretch Posts 'Sprawl Of Sin'"